SMART Programs is proud to offer you the Yamaha Riding Academy (YRA) program in association with Yamaha Motor Canada Ltd. The purpose of the Yamaha Riding Academy is to to provide basic motorcycle-riding instruction to boys and girls of approximately 6–12 years of age; it is offered at select Canadian motorcycles events. Safety is first. It is imperative that your child learn safe motorcycling techniques from a trained professional. This will ensure their future experiences will be that much more enjoyable. 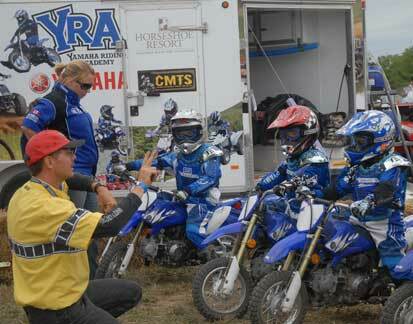 All YRA courses use either Yamaha TT-R50 or TT-R110, youth off-road motorcycles. The child must be adept on a bicycle without training wheels. Parent must be present for introduction, waiver sign in, participation and completion of all YRA courses.